The expression “Mermaid’s Purse” is slightly euphemistic. 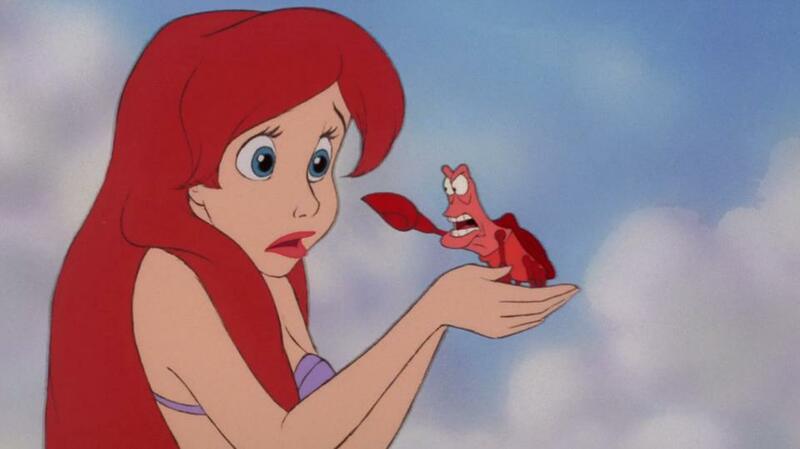 It conjures up images of Ariel and Sebastian, belting out another steel drum standard in Trident’s underwater kingdom. Personally, I like to imagine the mermaids leaving their purses in a pile on the sea floor; before dancing like buffalo in a defensive ring around the perimeter. The reality (that these beautifully crafted capsules have in fact emerged from a shark’s bottom) is less glamorous – but equally amazing. This beautiful example, found by one of our participants, comes from a Cuckoo Ray. Mermaid’s Purses are empty egg cases. Before you find them, mixed with heaps of rotting weed on the strand line, they were the cradle for a tiny Shark, Skate or Ray embryo. Each purse is made of collagen protein. Though they are often dry and brittle when you pick them up, they become soft and supple once re-hydrated. I’m not sure how Cliff Richard’s facial routine allows time for this process: Re-hydration can take several hours. It’s best to soak your eggcases before committing to an identification, as their dimensions can change significantly. The female Shark, Skate or Ray has paired ovaries. In most cases this means that she lays her eggs in batches of two, at daily or weekly intervals. The attractive curly tendrils added by some Shark species (plus a good old-fashioned helping of mucous for the Skates and Rays) are used to anchor these structures to strands of weed or the sea bed – securing their precious cargo to the spot with the best conditions for development. Incredibly, the eggs of our most common Shark species, the Smallspotted Catshark, can take between 5 to 11 months to hatch depending on water temperature. The embryo feeds on a yolk sac as it grows. In order to ensure its supply of oxygen, slits open in the eggcase and the embryo fans its tail to maintain a flow of water. Once the embryo has finished its development, it swims free of the eggcase as a perfectly formed, self-sufficient and predatory miniature. By collecting, counting and identifying these eggcases, it is possible to determine the location of key breeding sites for the different species. 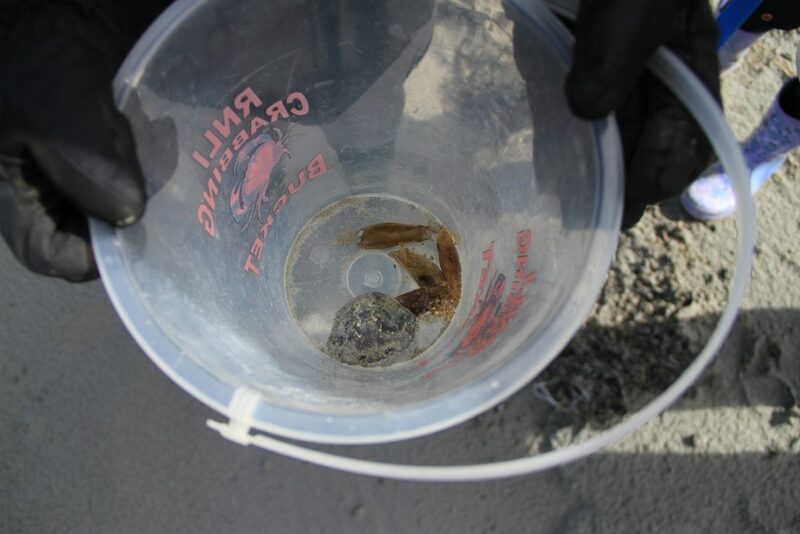 These budding eggcase hunters have found a Shore crab carapace, plus four Smallspotted Catshark cases. 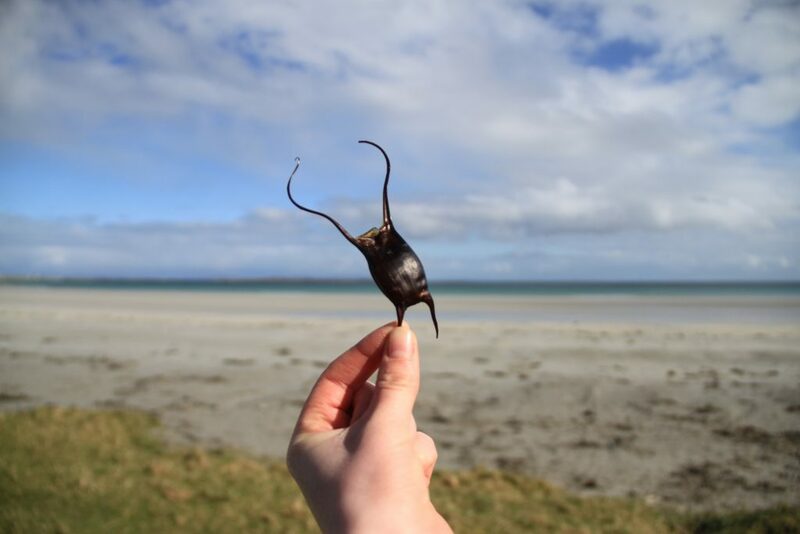 The Shark Trust runs a Citizen Science project to try and map eggcase distribution in the UK, known as The Great Eggcase Hunt. I’ll be honest: I wasn’t sure what sort of reception a public event to collect and count these eggcases would get. 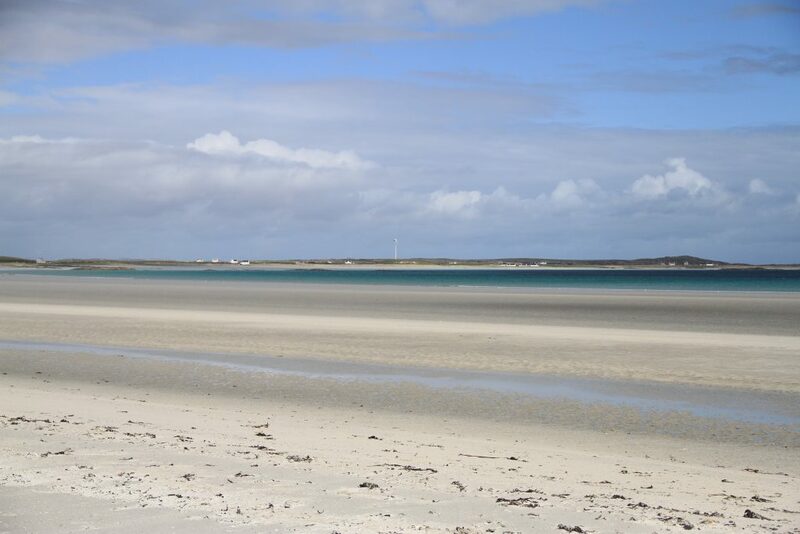 Standing on the carpark at Gott Bay, bellowing instructions at 140 expectant faces, I was suddenly awash with panic that we wouldn’t find any. Eggcase hunters in full swing on Gott Bay. Other interesting finds included a Harbour Porpoise skull. I needn’t have worried. Though I am yet to do the full count and ID session, our participants came back with at least 150 records. Probably more. On first impressions, there appears to be a good mix of species – though no Flapper Skate eggcases were found at Gott. 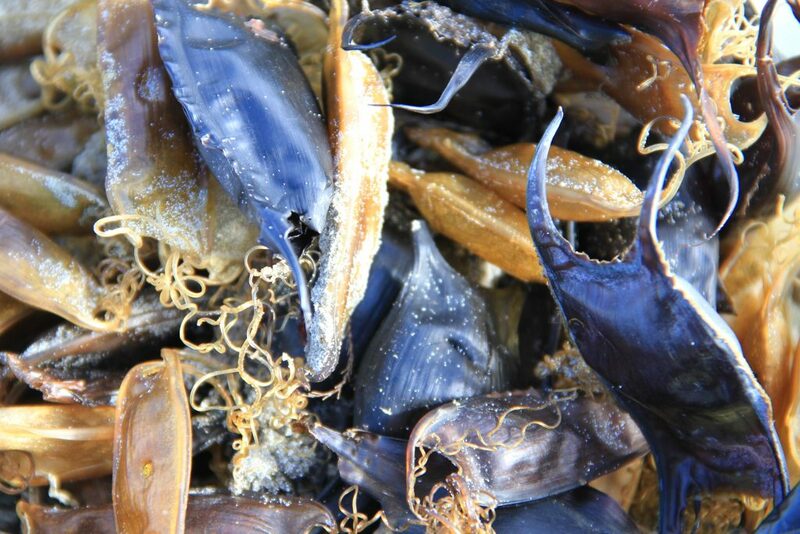 A small selection of the eggcases that we collected… what a haul! The Flapper Skate is the largest Skate in the world (achieving lengths of around 2.5m with weights in excess of a Vespa Moped) and the rarest of our target species. Incredibly, it is Critically Endangered at a global level but still breeds in the Hebrides. This species was once known as the Common Skate. However, it turns out that two separate animals were hidden under this single name (now known as the Flapper Skate and Blue Skate respectively). It’s always exciting to discover a new species – but dividing a single Critically Endangered species into two suddenly halves the population for each of them. This is not good news for the Flapper Skate. Like Sharks, Skates and Rays worldwide, bycatch and habitat degradation are heavily implicated in the decline of the Flapper Skate. Worse still, these huge animals are slow to mature and reproduce; populations struggle to bounce back from periods of acute decline. It is thought that these animals can live up to 100 years, cheerfully munching crustaceans, fish and even other skates (!) on and around the sea bed. 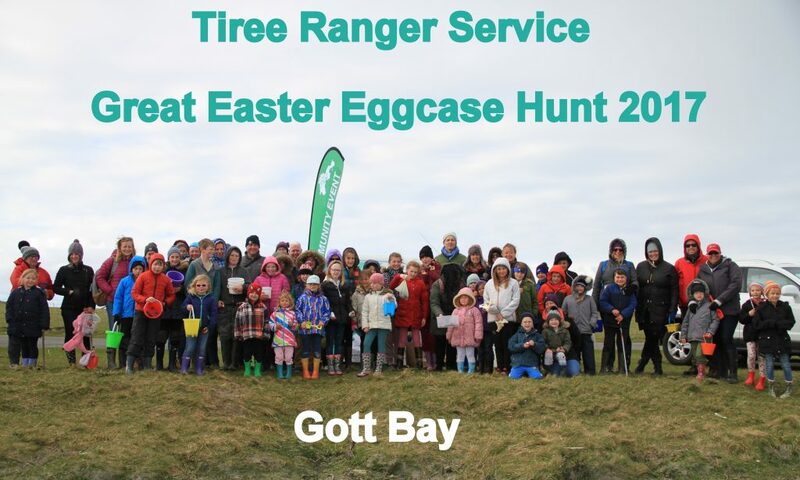 I would like to thank everyone that came along to support our Great Easter Eggcase Hunt. An extra special mention goes out to Willie MacKinnon (Youth Officer for Tiree Community Development Trust) for his help with the preparation and management of this event. I felt very proud to be part of a community that wanted to learn about Sharks, Skates and Rays – in addition to supporting their conservation by getting out, getting stuck in and gathering data. It was tremendous fun (despite the “mixed” weather) and I sincerely hope that everybody enjoyed themselves. The chocolate certainly seemed to go down well! 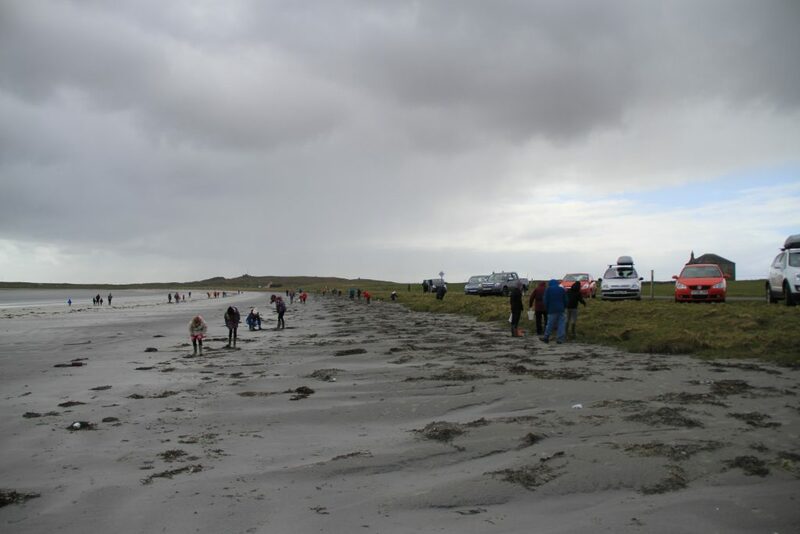 The weather was mixed with several showers coming through – but at times, Gott Bay looked totally tropical. I would also like to thank The Shark Trust – Cat Gordon in particular – for the outstanding work that they do, and the excellent educational resources that they provide.